Plant it: Landscape architect Jeni Webber replaced this solid driveway with two strips of concrete, leaving space for a tiny garden in the middle. 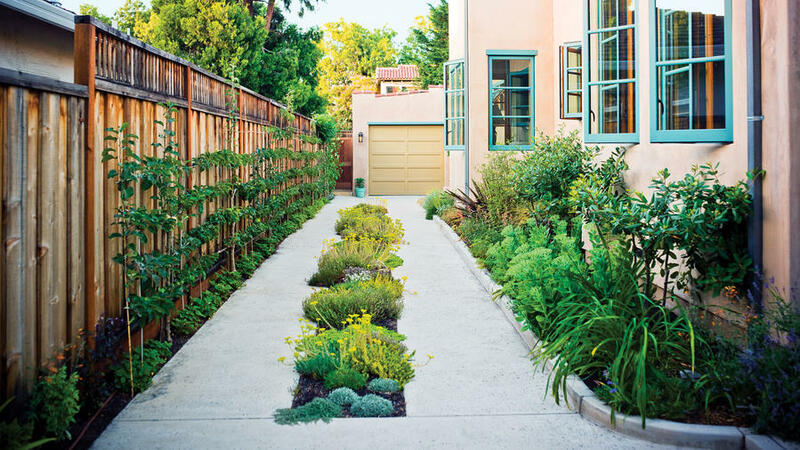 After the solid driveway of this Palo Alto property was replaced with twin ribbons of concrete, landscape architect Jeni Webber planted the new median strip with low-growing echeverias, dwarf daffodils, sedums, and creeping thyme that cars can still drive over (a garage lies at the rear). Then she created a pretty fringe on both sides, filling a bed beside the house with ceanothus, coffeeberry, daylilies, and other perennials, and planting alpine strawberries and espaliered apples and pears along the fence. “Instead of a boring, bland space, [the driveway] now has life,” Webber says. The driveway of this Culver City home was going unused, so landscape designer Suzanne McKevitt replaced part of the lawn with pavers to widen the space and convert it into a rela retreat. Replacing the lawn with more of the pavers used for the driveway was the first step. Then McKevitt created a screen of clumping bamboos, and set large planters filled with billowy acacia and grevillea midway down the driveway to block out the street and define the space. 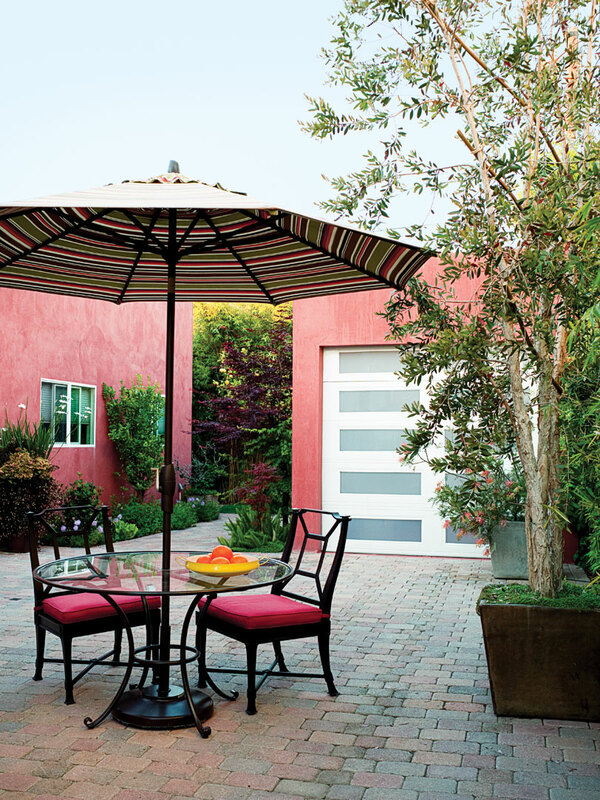 A house remodel crowded Marianne Lynde and Joe Lyons’ concrete driveway into uselessness—especially after they converted the 1927 garage at its far end into a garden shed and cabana. “The garage was built when cars were smaller,” explains Lynde. “We couldn’t get our cars into it.” So the Portland couple, working with landscape designer Mary Baum, removed the rear half of their driveway and put in a curving path of concrete pavers. A low cedar fence and extra-wide gate across the path have a welcoming look, but still keep stray children from wandering toward the koi pond out back.